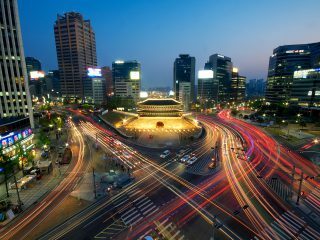 Seoul is a skyscraper city with ample opportunities for dining in a picturesque setting. 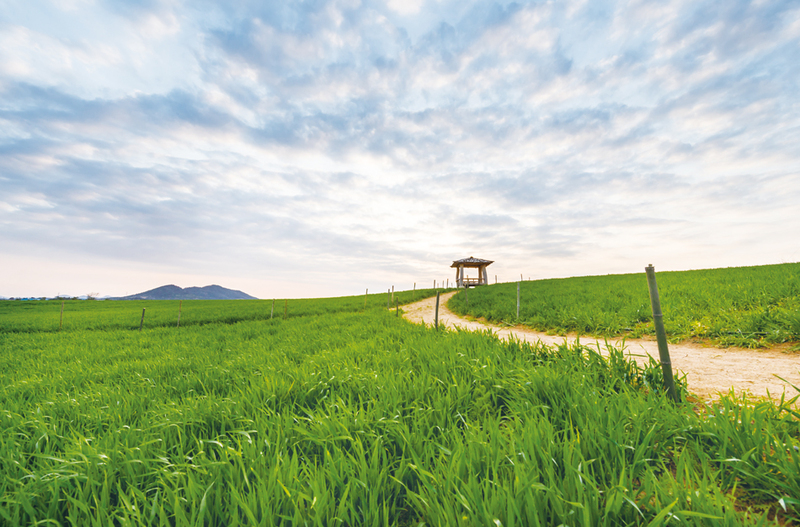 Whether you are at a peak of the metropolis’s surrounding mountain landscapes or south of the river in the hectic hub of Gangnam, you can undoubtedly discover an epic view of the Hangang River, hanok rooftops, or majestic skyscrapers. Uncover the cream of the crop through our guide to the most scene-stealing sights in the city and the restaurants from which to gaze upon them. Walking On The Cloud, located near the top of the golden-faced 63 Building, is one high-rise dining option close to the Hangang River. 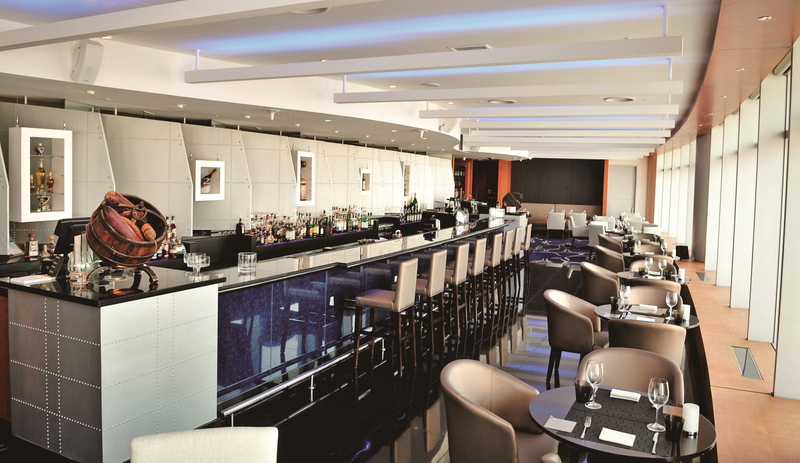 Based in Yeouido, the view from the restaurant is truly dramatic—and the international menu has a price tag to match. 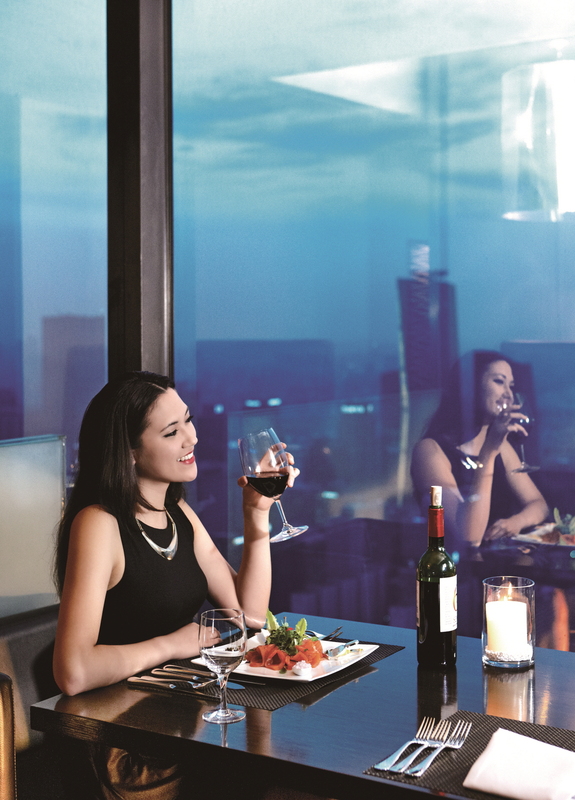 An evening at the 59th floor location will set you back between KRW 96,000–230,000 for a multicourse set meal. The crayfish starter comes highly recommended, however, as does the magnificent view. 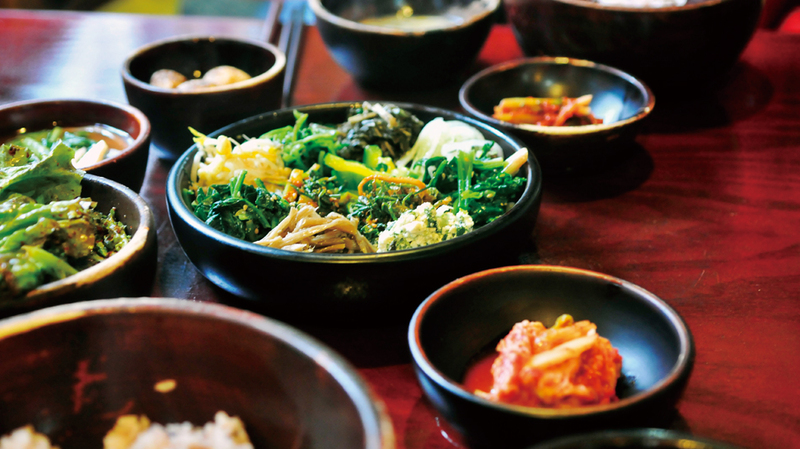 For more affordable fare at KRW 44,000 for an evening spread, Viking (T. 02-782-3344), an international buffet restaurant, has an excellent vista of the National Assembly at Yeouido—and the Hangang River behind it—from its 20th floor windows. Looking for somewhere a little closer to the water? A Season of Secret Garden (T. 02-413-5535), an Italian floating restaurant and wine bar in Jamsil’s dock, is situated right on the Hangang itself, with full-length windows emphasizing the aquatic view. While the restaurant’s flashy exterior and interior decor may not be to everyone’s taste, the beautiful river landscape will be. Skip the overpriced desert (KRW 12,000) and make your way to one of nine cafes situated on the six bridges linking southern and northern Seoul afterwards. Our top choice is Gureum Café (T. 02-3476-7999), where you can consume a soft drink or alcoholic beverage along with a spontaneous pork cutlet or steak meal while taking in Banpo Bridge’s Moonlight Rainbow Fountain Show from spring to autumn. While downtown Itaewon has many a rooftop bar, the preeminent views in this zone can be found on higher grounds. The elite viewing spot near the notorious foreigner district is of course at Namsan Tower. 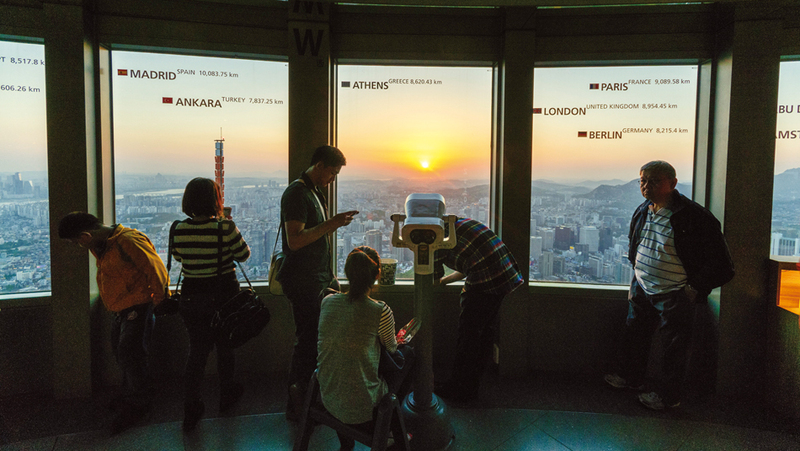 The view at the North Seoul Tower is especially astonishing from the N Grill (T. 02- 3455-9297) restaurant, a high-class eatery with a Michelin-starred head chef, serving French food in a pleasant, rotating restaurant. The Grand Hyatt Hotel’s The Terrace (T. 02-799-8166), with its international buffet and a la carte dining, also boasts excellent views of central Seoul. 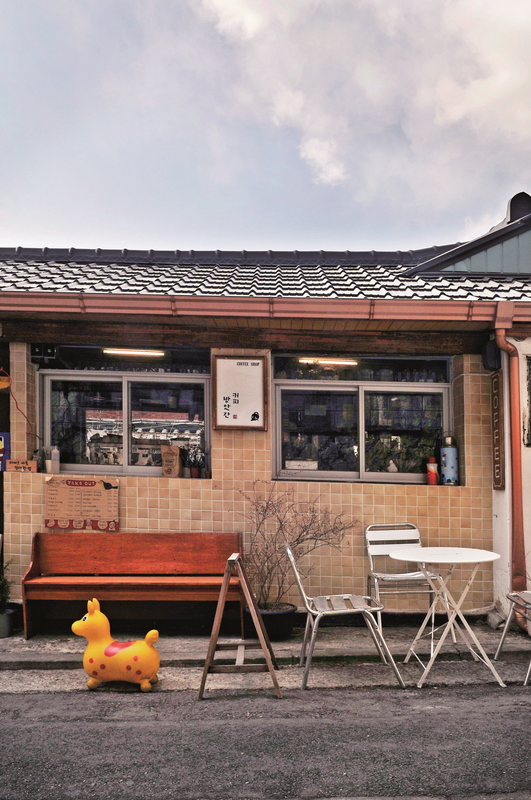 During spring to autumn, customers can dine on the quaint veranda and enjoy a stunning outlook of Hangang River. Akasaka (T. 02-799-8164), the Hyatt’s Japanese dining spot, displays a fix of visual nourishment from its full-length windows, too. Private dining is available for both restaurants and guarantees a view, but reservations are recommended. 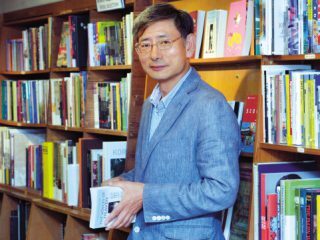 Near the Hyatt is Rufxxx (T. 02-511-2570), this writer’s favorite bar in Seoul. Hidden in the alleyways of Gyeongnidan, a stone’s throw away from Itaewon, Rufxxx is an artist’s former studio that serves simple meals on its first floor. While you cannot dine with a view at this establishment, you can look forward to drinking an after-dinner cocktail on a rooftop that boasts the stunning sight of Mt. Namsan and the Yongsan district. Il Vino Rosso (T. 02-7540-0113), a classic Italian restaurant, is located near the base of Mt. Namsan and has its own garden. Not only can you get a backyard view, you can also book a table with a Seoul scene below it. Dominic (T. 02-790-7558), a swanky steakhouse near Hangangjin Station, has floor-to-ceiling back windows overlooking the rooftops of Hannam-dong. While the view won’t take your breath away, it is pleasant, and the sumptuous steak dishes are recommended by local food bloggers. International dining spot Romanee Conti (T. 02-722-1633) in Samcheong-dong is hanok heaven, set slightly further back up the hill in a rustic, comfortable setting with floor seating. Try to nab the best seat at the window to eat dishes such as coq au vin with a view of Mt. 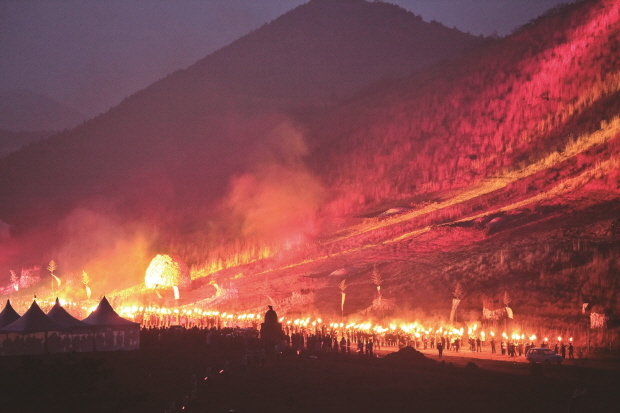 Bukhansan’s peak. Baedongbaji (T. 02-777-9696), a well-priced hansik, home-style restaurant, is tucked away in the alleyways leading up from the main Samcheong-dong drag and can be difficult to find. When you do finally locate the beautifully traditional restaurant, you will be utterly charmed by its quaint interior, peaceful atmosphere, and friendly owner. To consume with a perfectly framed tableau of Mt. Bukhansan, ask for one of the two upstairs rooms that face the mountain. The Restaurant (T. 02-735-8441), located next to Kukje Gallery, is more costly at up to KRW 148,000 for a 12-course Korean banquet, but has a beautiful, modern interior with a large window overlooking a portion of the outer wall of Gyeongbokgung Palace. For outdoor eating, Café Breezin (T. 02-722-8120), a desert and coffee shop serving the usual waffles and honey bread, possesses a lovely open rooftop with a street and mountain view. The superlative panorama in the local area, unfortunately, does not serve dinner. Go for post-supper drinks at wine and coffee bar Fatum’s outdoor terrace (T. 02-739-9888). Set higher than other shops in the area, Fatum provides a 180-degree panoramic view encompassing the older architecture in the vicinity of Samcheong-dong and some of the higher parts of Gyeongbokgung Palace, all the way down to Seoul’s modern skyscrapers. It can get a little chilly on the balcony due to the height, but blankets are provided, and customers can always move to an indoor, lower floor, where the views are still exquisite—especially if you manage to catch a particularly stunning sunset. One of the best views in the Gangnam area is from the 52nd floor of the COEX’s InterContinental Hotel at the sumptuously decorated Marco Polo (T. 02-559-7620) Asian and Mediterranean restaurant. 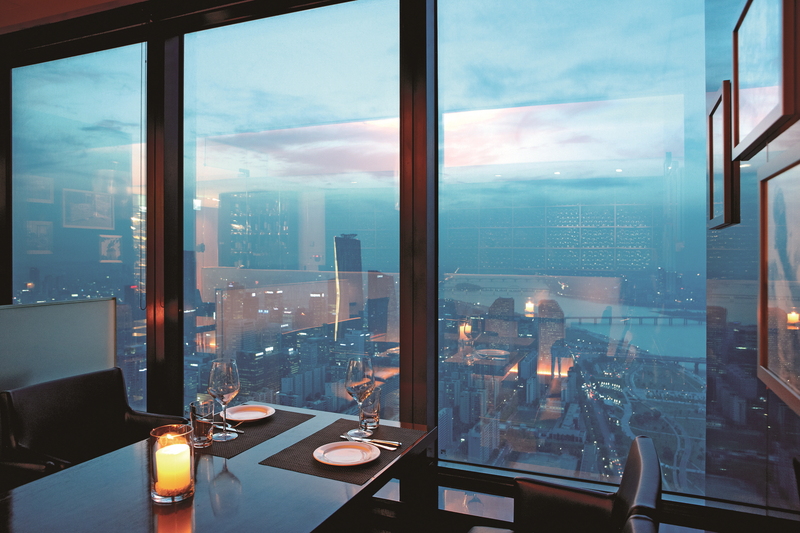 The window-facing booths compete with tables at the modern 30th floor Sky Lounge (T. 02- 3430-8630) for some of the greatest vistas of Seoul’s illustrious district. Another local restaurant with a scenic outlook is Arancio (T. 02-3400- 7200), a 26th floor Italian brasserie near Yeoksam Station where pasta dishes start at KRW 25,000. The owners of this eatery are said to have spent KRW 20,000,000 on their orange-tinted lighting, deliberately chosen to recreate the natural radiance of Tuscany. While the food at Arancio is not spectacular, it is reasonably priced considering the view is anything but mundane. Make sure to call ahead to reserve seating besides the windows. 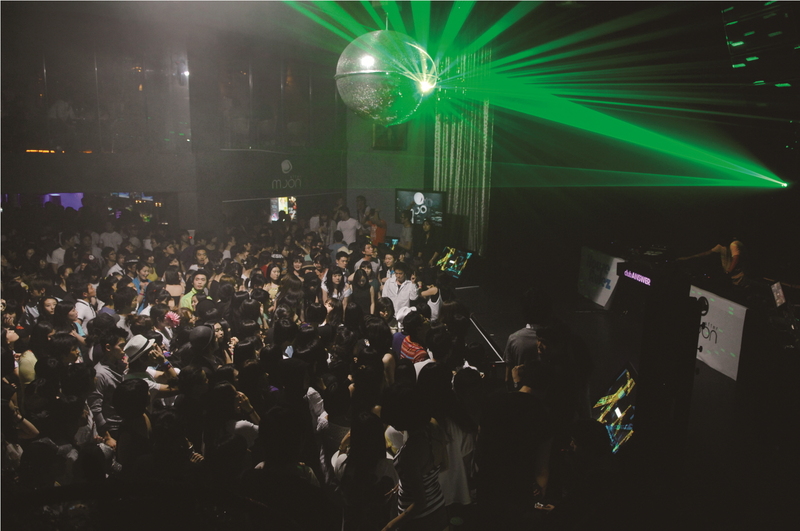 Seoul’s most glamorous ward also plays host to restaurants with some offbeat views. Charming Italian brasserie Buona Sera (T. 02-543-6668) and Asian fusion restaurant Zen Hideaway (T. 02-541-1461) both include leafy indoor gardens in the midst of their Apgujeong establishments. On a sunny day, Korean restaurant Samwon Garden (T. 02-548-3030) is a worthy choice for a relaxing meal in gorgeous surroundings. Eat outdoors in the traditional garden with its waterfall and fishponds while flexing your chopstick skills on some tasty galbi and bulgogi.